In reporting Thursday 7.4 percent gross domestic product (GDP) growth for the third quarter, China’s National Bureau of Statistics met economists’ expectations despite recording its slowest expansion since 2009 and the seventh straight quarterly downturn. However, annualized quarter-on-quarter growth grew to 8.8 percent in the third quarter compared with 8 percent in the previous quarter, boosting Beijing’s confidence in its ability to engineer a “soft landing” ahead of a once in a decade leadership transition. Recently, both the International Monetary Fund and Asian Development Bank cut their 2012 growth forecasts for China, to 7.8 percent and 7.7 percent, respectively. A government spokesperson said the economy would record a “modest recovery” in the fourth quarter after retail sales, investment and industrial production all surprised on the upside. “We are fully confident of realizing full-year growth above 7.5 percent,” said Sheng Laiyun, an official from the statistics bureau, who noted that China’s more developed coastal provinces were showing the first signs of improvement. Industrial production increased 9.2 percent and retail sales grew 14.2 percent last month from a year earlier, with fixed-asset investment notching up a robust 20.5 percent growth rate in the period from January to September compared to the prior period. House prices fell in 22 cities of 70 monitored but rose in 31, indicating that the battered housing sector may have hit its floor. China’s stockmarket reached a five-week high on the data, with the positive figures also boosting other Asia-Pacific markets. Stocks in resource-rich Australia reached a 15-month high, while Tokyo’s benchmark Nikkei Stock Average achieved its highest level in three weeks. However, while some analysts said the world’s second-biggest economy may have bottomed, power consumption remains subdued and hopes for another big fiscal stimulus package have faded. Amid skepticism over Chinese economic figures, ANZ senior economist Justin Fabo said one of the best cross-checks was gaming revenue in nearby Macau, a mecca for wealthy Chinese and Asian gamblers. In September, gaming revenue in the world’s largest casino market increased by a weaker than expected 12.3 percent, an indication that China’s economy remains subdued. Fabo said comparing China's GDP growth versus Macau gaming revenue revealed its economy may have stabilized. “Growth in China is modest relative to what it was, but it’s not deteriorating sharply,” he told the Queensland Japan Chamber of Commerce and Industry on October 16, noting a slowdown in credit growth and property construction. 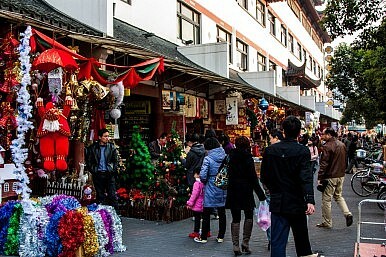 ANZ Bank expects the Chinese economy to record 7.8 percent growth in 2012, increasing slightly to 8.1 percent next year and 8 percent in 2014. According to Fabo, this slower pace is more sustainable for an economy that may have seen the last of its 30-year run of double-digit growth. “Our view is that China will post around 8 percent growth for the next couple of years due to fiscal policy stimulus. The Chinese economy is quite big now – per capita GDP is low but it now accounts for about 15 percent of global output,” he said. Fabo said China’s cyclical slowdown had contributed to weakness in other Asian economies, including Australia, but emerging signs of a recovery in the U.S. housing market were more positive for the global economy’s prospects. Beijing’s new leaders cannot breathe easy just yet though, with the financial sector coming under increasing strain and a continued reliance on fixed asset investment rather than consumption. But in pulling a rabbit out of a hat on growth, China’s statisticians have given markets cause for more optimism and reassured nervous investors ahead of November’s key 18th Party Congress. Various analysts warn that the recovery is likely to be tepid and the modest rebound could fade.